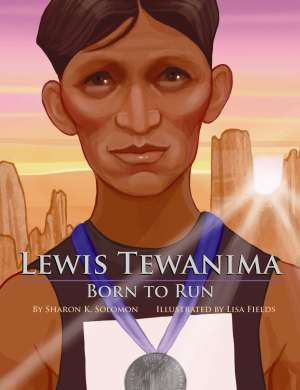 More than one hundred years ago, in a small Hopi village in Arizona, a young man named Lewis Tewanima loved to run. When the United States government took him from his home and forced him to adapt to European ways, he kept his connection to his tribe strong by running. Tewanima competed in many races, including the Olympics in 1908 in London, England, and again in 1912 in Stockholm, Sweden, alongside legendary Indian athlete Jim Thorpe. Tewanima set records and met a king and a president, and more than one million people came to a parade in his honor. But the famous athlete wasn’t truly happy as long as he was away from his tribe. Warm illustrations accurately bring to life the beauty of Tewanima’s homeland. Clear and compelling writing contextualizes the life of this extraordinary man for young readers. Inspiring and hopeful, this biography shows how one man stayed true to his home even while far away. Sharon K. Solomon is a retired elementary-reading specialist with more than thirty-five years of educational experience. She began writing children’s books as a teacher and has continued to write a variety of children’s works. Also the author of Pelican’s Cathy Williams, Buffalo Soldier and Christopher Newport: Jamestown Explorer, Solomon is an active member of the Society of Children’s Book Writers and Illustrators. She resides in Lansdowne, Virginia, where she is a member of a local writing critique group. Lisa Fields was always encouraged to pursue her dream of becoming an artist. She received a BFA in illustration from the Ringling College of Art and Design in 2006. The illustrator of several children’s books, including Pelican’s Barreling Over Niagara Falls, her work has appeared in Boys’ Life and Highlights magazines. Fields lives in New York City, where she is a member of the Society of Children’s Book Writers and Illustrators.